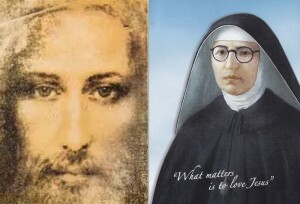 The Blessed Maria Pierina de Micheli, a holy nun who died in 1945, was urged in many visions by the Blessed Mother and Jesus Himself to spread the devotion to the Holy Face, in reparation for the many insults Jesus suffered in His Passion, such as to be slapped, spit upon and kissed by Judas, as well as now being dishonoured in many ways in the Blessed Sacrament by neglect, sacrileges and profanations. “Perhaps some souls fear that the devotion to my Holy Face may diminish that to my Sacred Heart. Tell them that, on the contrary, it will complete and increase it. Contemplating my Face, souls will share my sorrows and will feel the need for love and reparation. Is this not the true devotion to my Heart?”. These manifestations became more and more frequent and in May 1938, while Pierina was at prayer in the Community Chapel, a beautiful Lady, which she knew to be the Blessed Virgin Mary appeared on the altar step in a beam of light, holding a Scapular made of two small pieces of flannel joined by a cord. One of these pieces bore the image of the Holy Face of Jesus with the words “Iliumina Domine Vultum Tuum Super Nos” (May the light of Thy Face, 0 Lord, shine upon us) and the other, a Host surrounded by rays and the words “Mane Nobiscum Domine” (Stay with us, 0 Lord). – and they will have a peaceful death under the loving gaze of my Divine Son”. On the 30th of May, 2010, the beatification of venerable Mother Pierina de Micheli took place in Saint Mary Major Basilica in Rome, Italy. This entry was posted in Visions of Jesus and tagged Apparitions, BlessedMariaPierina, HolyFace, miracles, visions. Bookmark the permalink.